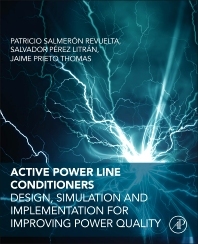 Active Power Line Conditioners: Design, Simulation and Implementation for Improving Power Quality presents a rigorous theoretical and practical approach to active power line conditioners, one of the subjects of most interest in the field of power quality. Its broad approach offers a journey that will allow power engineering professionals, researchers, and graduate students to learn more about the latest landmarks on the different APLC configurations for load active compensation. By introducing the issues and equipment needs that arise when correcting the lack of power quality in power grids, this book helps define power terms according to the IEEE Standard 1459. Detailed chapters discuss instantaneous reactive power theory and the theoretical framework that enabled the practical development of APLCs, in both its original and modified formulations, along with other proposals. Different APLCs configurations for load compensation are explored, including shunt APF, series APF, hybrid APF, and shunt combined with series APF, also known as UPQC. The book includes simulation examples carefully developed and ready for download from the book’s companion website, along with different case studies where real APLCs have been developed. Finally, the new paradigm brought by the emergence of distribution systems with dispersed generation, such as the use of small power units based on gas technology or renewable energy sources, is discussed in a chapter where mitigation technologies are addressed in a distributed environment. Patricio Salmerón Revuelta was born in Huelva, Spain. He received his Ph.D. from the Electrical Engineering Department of the University of Seville, Spain. In 1983, he joined the Seville University as an Assistant and then Associate Professor in the Department of Electrical Engineering. Since 1993, he has been a Full Professor at Escuela Técnica Superior de Ingeniería, University of Huelva. He is head of the research Group Electrical and Electronics of La Rábida, GEYER, and has directed several research projects related to electrical measurements in nonsinusoidal systems and equipment implementation to mitigate the lack of electric power quality. His research interests include electrical power quality, electrical power systems, active power filters and distributed generation. Salvador Pérez Litrán was born in Sanlúcar de Barrameda, Spain. He received his B.Sc. degree in Automation and Industrial Electronics Engineering from the University of Seville, Spain, in 2002, and his Ph.D. degree in Electrical Engineering from the University of Huelva Spain, in 2011. He is currently Professor and Head at the Department of Electrical Engineering, University of Huelva. His research interests include application of power electronics in distribution systems, power quality analysis, active power filters, hybrid power filters and renewable energy. Jaime Prieto Thomas was born in Madrid, Spain in 1969. He received his M.Sc. degree in electrical engineering from the University of Seville, Spain, in 1994. After three years of engineering practice, he joined the Electrical Engineering Department of the University of Huelva in 1997 as Assistant Professor. He is currently Associate Professor in the same Department of the University of Huelva. His main research interests are active power conditioning, power quality, and power converter analysis, design and control.